When I spin, I rarely have a project in mind for the resulting yarn. Although I’ve been a spindler since 2010, I still consider myself a beginner. I have the techniques down pretty well, but am still getting a feel how I want to spin different fibers. One fiber might result in a few very different skeins of yarn as I experiment and play. Sometimes I mix fibers together in different ways, and other times I make a small amount of consistently spun yarn. 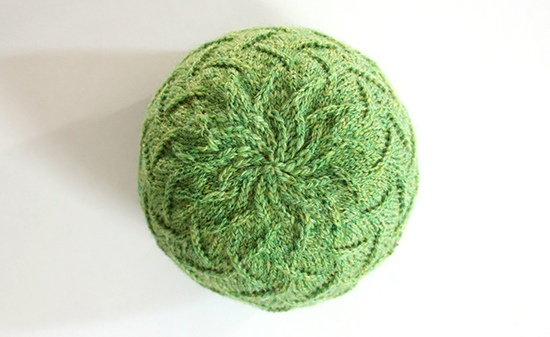 In 2012, I took a Spinning Samples class with Celia Quinn. Over three full days, we spun samples of 84 different types of fiber. Each sample was spun in both worsted and woolen styles where practical, then finished as both a single and a 2-ply yarn. Rather than continually starting and stopping, it was suggested that we bring some brightly colored fiber to separate the samples along the way. The fiber that I used to separate my samples was four ounces (113 grams) of 100% wool Kraemer Yarns Mauch Chunky Roving in the colorway Kiwi; I didn’t come anywhere close to using all of the roving. In 2013, I spun it into about 175 yards (160 m) of DK weight 2-ply yarn. And that brings us to this past week. 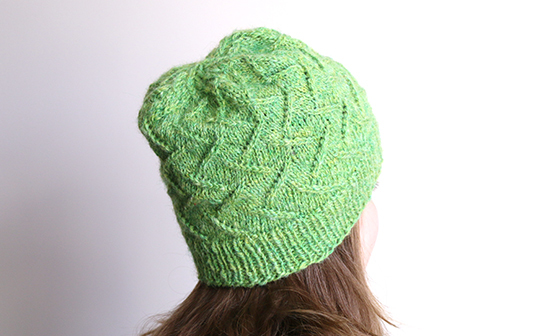 I was poking around in Ravelry and happened upon the free Irma Hat pattern by Aneta Gasiorowska. I was drawn in by the way the raised zigzag pattern in the body of the hat comes together and interlocks at the top of the crown. The yarn weight from my Kraemer handspun was just right, and I actually had a little more than the amount called for in the pattern. The pattern was easy to knit and worked up quickly. Although the pattern is written for one size, there is a note on how to adjust the sizing up or down. I don’t have a big head (ahem), but I do have a lot of hair so I added one repeat of the pattern to make the hat a little bigger. I’m looking forward to brightening up a dreary winter day by wearing this hat. And I’m happy to have found just the right project for one of my handspun yarns. Thank you! Our temperatures took a dip so I've been able to enjoy wearing it already. I love the color and pattern. You are very talented. Thank you again, Barbara, although I can't take credit for the pattern!